Some of us ride it. All of us need it. On Board with RFTA is the campaign to pass Issue 7A on this November’s ballot. The RFTA Board of Directors unanimously placed the property-tax question on the November ballot in the six municipalities and two counties that make up the authority—Glenwood Springs, New Castle, Carbondale, Basalt, Snowmass Village and Aspen, and Pitkin County and the western portion of Eagle County. Every RFTA community and the entire region will benefit from Destination 2040. Click here to learn more about Destination 2040. RFTA will continue to provide the critical transportation services needed to reduce traffic congestion and help maintain our strong regional economy and mountain quality of life. RFTA services do not just benefit its riders. Some of us ride RFTA. All of us need it. 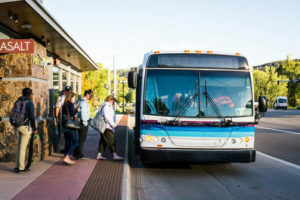 Without voter approval of 7A, RFTA will likely be forced to reduce regional services by up to 20 percent in just a few years in order to replace its aging buses. At the same time, projected population and employment growth, as well as housing development, will place more demands on our limited roadways and RFTA’s services. Approval of 7A is essential for our valley’s future. Your support will help pass Issue 7A in the November election.